This resort island 12 miles east off the east coast of the Yucatán Peninsula is a popular visitor destination. It is also FABULOUS for running, owing to the 65 km cycle path that was built to replace the old highway and that circles the southern part of the island. There are several lengthy sections with wonderful ocean views. The path on the eastern side of the island is especially spectacular! Our guide to running on Cozumel breaks up the coastal road into three sections, with a focus on the nicest spots. Also included are some of our favorite beaches for running. Cozumel is a 45-minute ferry ride from Playa del Carmen on the mainland. Between Paradise Beach and Palancar Beach. 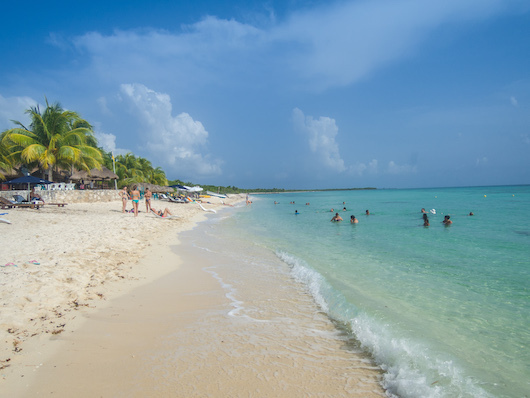 This 6 km stretch of beach on the west side is among the best for running on Cozumel. Quite wide in sections, firm sand closer to the water. Runnability might vary depending on weather & surf. Playa Punta Norte. ~1-2 km of nice beach for running on the nothern part of the western side, near the hotel zone. East Side There’s a beach along much of the east side coastal rode. It varies in runnability – some sections are wider, and it’s more rugged with bigger surf and less predictably firm sand near the water. It’s also possible to run around the town of San Miguel, where most of Cozumel’s 80,000 residents live. Many of the streets are narrow and don’t have sidewalks, but a leisurely DIY jog around town can be a ‘runseeing’ pleasure. Some of the nicest sections of the coastal multi-use path on the western side runs near San Miguel. 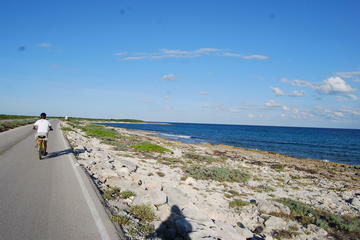 The Transversal de Cozumel is the 14 km road that runs between the west and east sides of the island. It has a good shoulder for most of the way, but it is interior and not as interesting for running. Cozumel weather is great for running at any time of year. During the summer months, highs average near 90F (32C) and it’s more humid, with near daily thunderstorms. Nights stay warm and humid as well. Hydrate accordingly during the summer months. Cozumel’s hotels are located off the main road on the nothern part of the island. There’s a cluster near the ferry terminals & San Miuguel, a little further south, and the northern part of the island near the golf course. There aren’t any hotels on the east side. Runners will have to drive or take a bus to enjoy some of the running on that path. One of the more famous Ironman triathlon races is held every November in Cozumel.